Mouvement Communiste/Kolektivně proti Kapitălu Letter produced in September 2015 about the situation in Greece, explaining the capitalist logic behind Syriza's policies and the state of the economy and class struggle in Greece. In July 2015, Greece was put in the world spotlight. The spectacle which followed it demands the answers to a series of questions of interest to the proletariat. Why was this famous referendum called, and by who? Who won and who lost? This electoral masquerade was the terrain for confrontation between the fractions of capital in Greece which are more internationalised on one side and the sectors of the dominant classes who are “pro-drachma” and hostile to a restructuring of the Greek economy and state carried out under European command on the other. These latter sectors correspond to petty Greek nationalism. Today they have a new political formation ready to represent them: Popular Unity, formed by the go-back-to-the-drachma brigade coming out of Syriza. 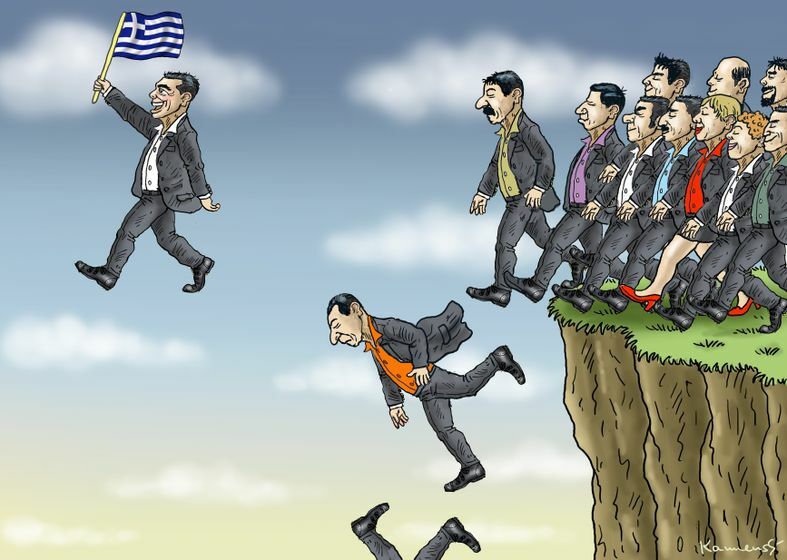 The referendum obliged the Syriza-Anel government to put its cards on the table, to unveil its real policies. The Greek referendum on 5 July 2015 asked this question: “Should the plan of agreement be accepted, that was submitted by the European Commission, the European Central Bank and the International Monetary Fund in the Eurogroup of 25 June 2015 and comprises of two parts, which constitute their unified proposal?”1. The response of the voters (62.5% of those registered) was unequivocal. No at 61.31%, Yes at 38.69% and spoilt or blank at 5.8%. So the political bet was won by the social-nationalist executive of Alexis Tsipras which had called for a massive No so as to “strengthen the Greek government in negotiations with the Institutions”. Despising it since their time in opposition, Syriza and its nationalist and racist allies in ANEL (Independent Greeks) had opportunely renamed the Troika since their conquest of central state power in the parliamentary elections of 25 January 2015. An overall majority of voters on 5 July believed in Tsipras’s bet. Hatred towards the Troika and its austerity prescriptions amplified the No result. In the same way, the active support given to the Yes camp by most of the caste of politicians who had governed Greece for the last few decades convinced significant sectors of the proletariat to use the referendum to show their hostility to them once again. Finally, the appeal to nationalism provided the last and the main ingredient in the triumph of No. References to the Peloponnesian war in 431-404 B.C., to the war of independence from the Ottoman Empire in the 1820s, via the resistance to the German occupation of 1941-45, ending up with the student uprising of 17 November 1973 which marked the beginning of the end for the dictatorship of the Colonels – all this to flatter the national pride of the Greeks so they’ll vote No. For the occasion, Syriza abandoned its pale pink flags to inundate the squares with the white and blue national flag. Perfectly at ease in this carnival of nationalism, its ally ANEL outbid them in patriotism by targeting the “German Nazis”. These comments hit the mark, including amongst the “leftist” base of Syriza, always ready to re-gild the myth of the Resistance to achieve today’s aims. After the referendum it became clear that the No was largely down to the following groups of people: young unemployed; state employees, who dreaded new cuts in staffing levels, the end of supplementary pensions and the raising of the retirement age all at the same time; the elderly poor, who feared more of the same treatment; the inhabitants of the islands, threatened by the rise in VAT on the islands demanded by the Troika; the small businessmen and peasants for whom a tax demand is effectively a death warrant. The shipowners were also tempted by No because, in the case of a switch to the drachma, they would have continued to be paid in US dollars but their wage costs would have been reduced, perhaps by half, because they would be denominated in the new national currency. They are also targeted by the Troika for an increase in tax payments. On the side of the Yes vote, we find: the bosses most integrated into the world market (except for the shipowners); the liberal professions and the property owners terrorised by the prospect of seeing their savings in euros transformed into devalued drachmas; the intelligentsia and also minority sectors of private sector employees (mostly in export companies) who risk losing their jobs if Greece abandons the euro. Around 45% of the electorate did not participate in the referendum or spoiled their votes, or left them blank. That is, roughly the same number of people didn’t adhere to the dominant idea that this vote was going to change their condition. Sociological and political analysis of the vote contradicts the dumb leftist who wants the two camps confronting each other to be separated by class, capitalists on one side (Yes) and proletarians on the other (No). In the No camp we can find the traditionally reactionary petty bourgeoisie as well as the enraged unemployed, the shipowner as well as the salaried manager in the public sector. And in the Yes camp there are certainly a majority of rentiers, of petty bourgeois liberal professionals and bosses but also workers in the private sector scared for their jobs. For those who insist that No was a class vote, here are some examples of bosses who were themselves very involved in the No campaign: on 1 July, Dimitris Gianakopoulos, the CEO of Vianex openly took the side of the No partisans during the “The Diamonds of the Greek Economy 2015” meeting. The supermarket chain “Galaxias”, known for its nationalist publicity along the lines of “we’re a strictly Greek supermarket with Greek capital and Greek workers”, also supported No. For this business a harder competition with the big foreign retailers could put them in serious difficulties. Also, austerity reduces the purchasing power of their customers, leading to a loss of profits for “Galaxias”. The result of the vote, it should be clear, has not had any effect one way or the other. The young unemployed are going to stay that way just as long, pensions are going to be “reformed” in line with what the Troika wants, VAT on the islands will rise along with taxes on agriculture and even the shipowners will probably have to rearrange their business activities to continue to escape Greek taxes. To put it another way, fundamentally the Troika has won all along the line and, with it, “internationalised” Greek capital which wants the country to keep the euro. The new austerity plan and the “reforms” that the Greek government was rushed into adopting imply cuts of 12 to 13 billion euros, compared to the 8.5 billion euros in the plan proposed by the Troika on 26 June, less than ten days before the referendum, and the counter-plan put forward by the Greek executive at the time for cuts of 8 billion euros. As the myth of the “radical” European Left quickly fades, has Alexis Tsipras lost everything, as is claimed by the pro-drachma minority of Syriza (today gathered in the new formation, “Popular Unity”) as well as plenty of No voters? Has he betrayed the mandate of the electors? Answer: No on both counts. The decision to organise the referendum was dictated by internal reasons. Alexis Tsipras knew that the parliamentary majority wouldn’t approve the latest plan of the Troika, nor even one concocted by his cabinet, before an appeal to the vote. He also knew that the population dreaded above all else the return to the drachma, which would mean a massive and sudden depreciation of wages and savings under present conditions, given that Greece is a big importer of agricultural products (52% of domestic demand) and energy (85%). From then on, the squaring of the circle had to come from the polling booth. The No translated into personal victory for the leader who used it to marginalise the partisans of the drachma inside Syriza and constitute a semblance of national unity in Parliament around the acceptance of the recommendations of the institutional creditors. Alexis Tsipras did not betray the voters because he understood very well their desire to remain in the euro at any price. His only “fault”, if you can call it that, has been to “sell out” the nonsense of a No which would be a barrier to austerity. But in that he only exploited the democratic bourgeois illusion of an all-powerful popular sovereignty. A pure product of the consolidated relations between Greek capital and the state, the young leader of Syriza showed himself as seasoned as his predecessors in the anti-worker operations of electoralism. The long drawn-out objective of Tsipras and his cabinet has also been achieved for the moment: avoid the collapse of a bankrupt state and guarantee it the support of a significant portion of civil society despite the breakdown of the principle mechanisms of economic integration because of the state’s fiscal crisis. Without money in the state coffers, the executive has scraped money together from all the state institutions (regional bodies, pension funds, health insurance) before giving in to the Troika. The government reduced public spending as far as it could. In the course of the first six months of 2015, it spent 23.2 billion euros, against more than 26 billion over the same period in 2014. Revenues fell by almost 2 billion euros over the same period, to 21.8 billion. In this sense, Syriza in government has more or less pursued the policies of restriction of state spending of previous governments. The Samaras executive (Pasok social-democrats + New Democracy centre-rightists) squeezed total spending on public administration by close to 11% between 2013 and 2014. This was a percentage comparable to the cuts made by the Syriza-ANEL government between January and June 2015. The most severe budget cuts carried out by the present government were aimed at family allowances, hospitals and employment services, explains the MacroPolis site2. According to a study published at the end of 2014 by the Ministry of Labour, in 2013 in the private sector almost 22% of some 1.5 million people worked part-time or were on fixed-term contracts. Close to 40% of the 1.2 million working full time and with a permanent contract only made between 500 and 1,000 euros net per month and almost 9% of them were paid below the minimum wage of 680 euros for 14 months. Based on the official declarations sent by employers in 2014 to the social security services (IKA), the ratio of wages paid below the contractual minimum established for unskilled workers increased in 2013 to 33% of the total, versus 17% in 2011. Almost 40% of workers in the private sector then earned around 630 euros net per month. By comparison, a newly qualified secondary school teacher receives a monthly income of 1,100 euros. We should also take account of work on the black. According to the Greek Labour Inspectorate, 14% of private sector workers were undeclared in 2014. Most of them were immigrants (10% of all foreigners). The crisis and the restricting of the state have weakened all sectors of wage earners but the casualised workers of the public sector and the less skilled in the private sector along with the unemployed have been the segments of the proletariat most targeted by the bosses and the policies of the Troika and the governments which have succeeded each other since 2010. In January, Syriza had promised to raise the minimum wage, to not cut pensions and to preserve the public sector. Today, to preserve the state, it accedes to all the requests of the Troika. A new Pasok, its priority is to defend the interests of the public administration from which come most of its cadres and activists along with the state union bureaucracy whose contractual legal prerogatives were swept away by the Second Memorandum, and which Syriza has tried to restore. On this particular point, Syriza intends to re-establish the institutional mechanisms of social conflict mediation rudely damaged by the crisis and the struggles of recent years. All the rest is not a priority for Tsipras’s party. Its victory in the elections at the end of January 2015 is the product of the defeat of the movement of resistance to austerity which culminated in the days of revolt of 2012 and the occupation for several months of Syntagma Square by thousands of participants from the most diverse backgrounds, but mostly the young. The defeat of this extensive movement (on this count, we recommend a balance of the events written by a Greek comrade from the Skya group5) led many of its participants to try the electoral route with Syriza, whose take-off coincided with the end of the mass struggle in the streets. In this sense, the victory of the No was the last gasp of the illusion kept going by this political formation over the ashes of the movement of resistance to austerity. It was its tombstone. The mask fell. The euphoria of the No “victory” gave way to the harsh reality of the real balance of forces and Syriza being forced to reveal its real reason for existing: to defend the Greek state-boss, including, if it’s necessary, at the cost of a fight with “private” capital. So, for example, we get the proposal to increase corporation tax from 26 to 29% (the Troika ended up fixing it at 28%), the exceptional tax of 12% on the profits of businesses with a turnover of more than half a million euros (not accepted) and declarations of war on tax evasion (the Troika wants the executive to turn words into action). So why did the Tsipras government wait so long to give in to the Troika when it knew perfectly well that it did not have the means that its policies required and that it had plunged the country into crisis again? The real differentiator between the institutional creditors and the Greek executive was the agenda of restructuration of the Greek state apparatus. The former demanded so-called “reforms” before tackling the issue of a second write-off of debt after that of the PSI (Private Sector Involvement) of March 2012. In the end, with this operation, it was 105 billion euros of debt held by the private investors which was written off. Advised like his predecessor George Papandreou by the French merchant banker Mathieu Pigasse from Lazard, Tsipras wanted to wipe out 100 billion euros of supplementary debt before starting the negotiations on “reforms”. As the months passed, the so-called “red lines” that Syriza would not cross in negotiations were crossed one after the other. Finally, it became clear that the positions of the Troika and those of the social-nationalist Greek executive were not so far apart. And this was the case from the start of negotiations. The difference in time sequence, “reforms” first or debt write-off first, corresponded to two different logics leading to the same result: restoration of the Greek state with all its prerogatives. The Troika wanted to be sure of what it called the “supportability” of the debt – that is, the capacity of the Greek state to meet budgetary obligations in time. That said, even within the Troika important contradictions emerged. Before shelling out even more money within the framework of the Third Memorandum, the IMF demanded an important new restructuring of the Greek debt entirely applied to the loans of European creditors under the pretext that, in its statutes, it is forbidden to give money to a country which has not completely paid off previous credits granted by the Fund. The ECB and the other capitals of the euro zone in their turn don’t want to pay the costs of the eventual restructuring of the Greek public debt, arguing that European treaties forbid any “transfer of wealth” from one country to another, including in the form of writing off debts from European institutions. The point of mediation between the European creditors and the IMF is probably going to be found in the form of a significant extension of the due dates for repayment of loans and, perhaps, by the delay of a few years in instalments of interest on these loans. But, at this stage, the game between institutional creditors is not over. The Troika demanded that new measures be put into practice which would reduce the value of labour power (public sector employees and pensioners), introduce new cuts in spending (the army), new increases in business taxes and VAT, and privatisations. Also, to raise the funds of the state with greater revenue, the Troika wants to entrust the collective negotiation of labour contracts to each workplace. This has the aim of lowering wage costs and so increasing the profitability of businesses, and, by that, their ability to pay taxes. Finally, the Troika wants to “free up” the sale of goods and services under the regime of monopoly to inject the advantage of competition and favour the centralisation of capitals, which are too often dispersed (e.g. pharmacies or doctors’ surgeries). Beyond the grand phrases, the Tsipras government, for its part, envisages similar measures but applied more gradually and with a different mix to come to a compromise with the interests of sectors targeted by the Third Memorandum when it was being defined. Or, the best means of gaining time was to straightaway obtain a massive drop in the public debt with the aim of recovering the market position of the sovereign debt and freeing up indispensable revenues to maintain the status quo for the longest possible time and to manage the segments of civil society which are going to be hit by the “reforms”. Obtaining a debt write-off amounting to a third of the state debt also served as a way of showing the population that Syriza is a party which is different from the others, a party capable standing up to the powers of the whole world, a party which could provide an example to all the social-nationalists of Europe, from the extreme-right to the extreme-left. It’s a game well understood by the Troika which has tightened the strings of financing of the Greek banking system and stopped any discussion about new loans. In perspective, there is a new plan for international loans of the order of 100 billion euros, of which around a fifth for the Greek credit institutions left drained from the capital controls imposed by the ECB, but above all by the creeping “bank run” which has diminished by half the sum total of customer deposits between September 2009 and May 2015, and also by the growth of bad debt. This sum of deposits went from 237 billion euros to 129 billion (of which around 40 billion euros were taken out since January 2015). The creditors at risk of not being payed represented on average 41% of all the shares of the four main Greek banks, estimates Barclays Capital. They are unable to finance themselves on the market. Their coffers are stuffed with Greek state bonds. Their very short term survival depends on injections of liquidity from the ECB. As a result, the banks haven’t been lending for a few years, the sources of market financing have dried up (shares and bonds), savers export their savings or hoard them out of fear of seeing their euros turned into drachmas. The function of the deferred payment instrument is strongly diminished to the point of blocking most investment projects. On the contrary, the function of currency as a means of circulation has been strongly reinforced. Banknotes in circulation in Greece rose to some 50 billion euros, almost a third of the expected 2015 GDP. By comparison, the average for the euro is 10% of the total GDP of the countries involved6. The fiscal crisis of the state has turned into a banking crisis and a monetary crisis with the credit function of money severely damaged. Capitalism without credit doesn’t function7. Businesses no longer invest or not enough to increase the productivity of labour. According to Natixis8, productive investment in 2015 returned to the level of 2002 after having climbed to a level 80% higher by 2008/2009. The same source indicates that while public expenditure still represents almost half of GDP, investment by the state in facilities and infrastructure fell from 5% of GDP in 2008/2009 to 3.5% today. The most severely affected sector is that of public works. Between 2008 and 2014, the number of Greek SMEs fell by almost 230,000 destroying some 700,000 jobs in their collapse, if we can believe a recent study from the Centre for Economic Planning and Research (KEPE). Nevertheless, the state fiscal crisis has not destroyed the industrial cycle. Profits after taxes, interest and dividends for companies (in all sectors taken together) correspond in value to 12% of GDP between 2014 and 2015. It was of the order of 10% of GDP in 2012 (Natixis). The reason? Only one: reduction in the price of labour power. And the sector which has posted the best results since 2009 for productivity per head in constant thousands of euros, is manufacturing, while construction is in free fall (Natixis). Manufacturing industry represents close to 15% of net added value (the difference between turnover and the cost of intermediate goods consumed), against less than 13% in 2003. On the other hand, construction has seen its part of net added value plunge from 7% to 2%, according to Eurostat. The information and telecommunication industries have also done well, today representing 5% of net added value. If we recall that maritime transport counts for 7% of GDP and that it has endured well because of its internationalisation, without counting the good health of the big tourism companies (tourism as a whole is worth almost 10% of GDP), we can see that despite the state’s fiscal crisis a good third of the Greek capitalist machine continues to generate and to realise value. Certainly the road to capitalist normalisation in Greece is still very long. The restructuring of the state is the indispensable condition for it to succeed. It is a state which, in the fiscal crisis, has acted as an individual capital equipped, like all states, with particular means and rights, defending tooth and nail the particular interests of a tentacled public administration, which is very powerful and linked to significant segments of society by clientelism and endowed with strong connections with organised crime. The survival of the state with all these networks of interest has temporarily taken over from the “good” functioning of capital accumulation. The Greek proletariat has tried to seize the occasion of the state crisis to launch its offensive by starting to defend itself against the restructuring of capital in its expenditure and austerity. But its dispersion in hundreds of thousands of SMEs, its intensified division into unemployed, public sector and private sector workers and, above all, its relatively peripheral location with regard to the big European and global workers’ concentrations has not allowed it to win. The isolation which it has been left in by its class brothers and sisters of the whole world in 2011 and 2012 has been fatal. As is true for the Greek bourgeoisie, the revolutionary solution for the working class of this country is not in Greece. Greek proletarians can still give an example by freeing themselves from the democratic and national illusions which have lead them to defeat. The Greek workers can still be the spark which sets the region alight but they will have to go beyond insurrectionism with no tomorrow, the litany of confrontations with the cops in Syntagma Square, to take the more difficult path of struggle in workplaces, in neighbourhoods, against the bosses, the state and its henchmen for reappropriation, wages and the construction of its political autonomy. The new political bet by Syriza and its leader, the holding of parliamentary elections anticipated at the end of September 2015, will be nothing other than a faded repetition of the referendum dispute, where the real game is that of purging and isolating the pro-drachma fraction of Syriza which is now present with its own list called Popular Unity. This time the decision to go back to the polling booths is a plebiscite for the Troika, which is no longer scared of an isolationist “Little Greece” slide by Syriza. Testifying to this is the fact that several European leaders took positions in support of Tsipras just before or after the official announcement of the resignation of the Greek Prime Minister9. The ECB holds, in total, 22 billion euros of Greek state bonds. The path to two currencies would have accelerated the flight towards the stronger currency, certainly the euro. The depreciation of the IOUs would have been rapid and violent. The “taking” of the Bank of Greece, the central bank of the country and a member of the Eurosystem of the ECB, would only have allowed them to get their hands one five billion euros of official reserves, including barely one billion euros in hard currency. The rest is essentially gold bars and Special Drawing Rights11, of limited duration and difficult to exchange in case of “declaration of war” against the ECB. This treasure would not even have permitted the Greek state to bail out the country’s banks, which need, and so say all the parties, between 10 and 25 billion euros of fresh capital. As for the unilateral depreciation of the ECB’s Greek bonds, it would have been no more than a scratch on the balance sheet of the central bank stood at more than 2,500 billion euros… An ambitious plan therefore, whose consequences would have been irreparable for the state, the local banks and the population. A veritable Plan B, that of restoring “monetary sovereignty”, was conceived by a bunch of economists from the Left Platform, the Trotskyo-Maoist minority of Syriza who represent 35 to 40% of the active members of the party. This strategic objective, monetary sovereignty, is also shared by the Independent Greeks, the Stalinist party (KKE) and the Nazis of Golden Dawn. One of the key figures of the “think tank” for the drachma inside Syriza (today inside Popular Unity) is Professor Costas Lapavitsas. In his intervention on 17 July 2015 at the “Democracy Rising” conference held in Athens, the Professor set out the famous Plan B rejected by Alexis Tsipras and his government. This plan is a concentration of traditional Trotskyo-Stalinist recipes: nationalisation of the banks (but without “workers control”, just changing statutes and managers); permanent control of capitals, “But properly operating bank and capital controls, not this ramshackle affair that we've witnessed the last two weeks” he insisted, and a forced exchange for the new currency12; rationing of petrol, pharmaceuticals and food nicely described as “organisation of the supply of protected markets”. Do we have to remind him that Greece imports more than 50% of foodstuffs and 85% of energy products, without mentioning the almost 100% of capital goods, means of transport, materials and services for high technology, and that imports have to be paid for in dollars or euros? The only question that the eminent Professor Costas Lapavitsas asks himself is “how to take the pressure in the exchange rate”? But, like any clever guy, he answers promptly: that will not be serious because “the exchange rate's probably going to dip and going to rise again. That's typically what these things do”. Thank you, Sir, for the truism! The only question for proletarians is to know how much purchasing power they are going to lose with the forced introduction of a currency which no one wants, and over how much time. Yet, once again, this summit of economic thought contains the solution to the enigma: “And it [the drachma exchange rate] is going to stabilize to some kind of devalued rate. I'd expect 15-20 percent devaluation, the final position”. In their great majority his economist mates reckon on a durable depreciation of 30 to 50%. But even if Costas Lapavitsas is right, there has to be a cut of a fifth in wages, pensions and unemployment benefits. Not bad for a leftist! A sacrifice necessary to restore the authority of the state and make Greek capital “return to growth”. “I'd expect positive rates of growth overall to begin to materialize after about 12-18 months. Once that period of adjustment is over, I would expect the Greek economy to return to fairly rapid rates of growth in a sustained way”. A robust “growth” which he foresees being brought about by “the re-conquering of the domestic market” by the Greek productive sector and by the never-ending Trotskyo-Stalinist call for a “sustained program of public investment to boost also private investment and to lead to growth for years ahead”. Save the non-competitive Greek businesses and restore the prerogatives of a bankrupt state, these are the two priorities espoused by the leftie Professor. “First, default on the national debt. The weapon of the poor is default. Greece must default on its debt. There is no other way out. The debt is crushing it. So default on the debt is the first step to achieving a deep write-off of the debt. Second, nationalization of the banks. Effective nationalization of the banks. When I say nationalization I mean appoint a public commissioner and a group of civil servants, selected civil servants with some technocrats who know what to do and take over the running of the banks and ask all private management to go home. That's what needs doing. No ifs and buts. And the legal structure must be changed accordingly. It's very easy to do. The Greek banks at the moment have got majority share ownership, which is public, basically. They need to be turned into. The banks must continue on the bank and capital controls. Half the job of exiting this disastrous monetary union has already been done. But properly operating bank and capital controls, not this ramshackle affair that we've witnessed the last two weeks. Properly functioning bank and capital controls that would allow working people and small businesses to start functioning again. It's perfectly possible. Perfectly possible. We've seen it time and time again. Next, conversion of all prices. Conversion of all obligations. Conversion of all money stocks at the rate of 1:1 to the new currency. Anything under Greek law can be converted. Those who hold deposits will lose some purchasing power. Not nominal value, but some purchasing power. But they will gain because the purchasing power of what they owe in debt will also decline. So the majority of people will probably gain from this. Next, organize the supply of product markets. Oil, medicine, and food. Perfectly possible to do with an ordering of hierarchies, so long as you start doing it a little while ahead, not at the last moment. Because obviously if you're thinking of doing this on Monday morning and the first you thought of it was Sunday night, it's going to be difficult, yes. I agree. And finally, decide how to take the pressure in the exchange rate. How to operate the exchange rate. The exchange rate's probably going to dip and going to rise again. That's typically what these things do. And it's going to stabilize to some kind of devalued rate. I'd expect 15-20 percent devaluation, the final position. Decide how to defend that and how to handle it. … So the contractionary aspect [after leaving the euro] will last several months, then the economy will pick up. So the contractionary aspect will last several months, then the economy will pick up. Positive rates of growth might take longer to appear because the blow to consumption, the uncertainty, the blow to small and medium businesses is likely to be significant. I'd expect positive rates of growth overall to begin to materialize after about 12-18 months. Once that period of adjustment is over, I would expect the Greek economy to return to fairly rapid rates of growth in a sustained way. The reason – two reasons for that. First, the re-conquering of the domestic market. Changing the currency this way would allow the Greek productive sector to re-conquer the domestic market, to recreate opportunities and activities, something which we've seen time and again whenever you have monetary events of this scale. And with the left government this will be fostered. This will be made to go faster in a more successful way. Partly because exports are also likely to pick up. Partly because there will be a sustained program of public investment to boost also private investment and to lead to growth for years ahead. 1. As translated by BBC News website on 29 June 2015. More than half of all households declare that pensions are their main source of income, says an enquiry carried out at the beginning of 2015 by the Hellenic Confederation of Shopkeepers and Artisans (GSEVEE). Finally, the forces of repression and the army took almost 7% of spending (6% in the euro zone on average). Incidentally, the new plan accepted by the Tsipras government and imposed by the Troika is focused on reducing spending on general state services, reduction of generally rising pensions and reducing military spending, the three pillars of state spending which exceed the European averages. On the other hand, the parts of state spending that have already been trashed are those of housing and facilities (0.5% of total spending, against a euro zone average of 1.4%), health (8.6%, against 14.7%), culture and leisure (1.1%, against 2.2%), education (7.6%, against 9.7%), sickness and disability assistance (2.5% against 5.5%), assistance for families and children (1.1%, against 3.3%) and dealing with unemployment (1.5%, against 3.8%) for an economically active population where a quarter don’t have jobs (almost 60% youth unemployment). And then more than a fifth of the population of the country are not able to feed themselves every day on meat, fish or vegetable equivalents, according to a recent study by Elstat, the Greek statistical service. “In 2013, 23% of Greek households were plunged into poverty. The poverty line is defined by income less than 60% of the median income of 16,170 euros per year. It is the second highest in Europe after Serbia. Families close to this line were some 36% of the total in 2013, against 28% in 2009. Amongst the most vulnerable groups of the population, are counted unemployed men (more than half are poor),households with three or more adults, and children (38% of the poor are in this category),isolated parents (37%),economically inactive people who don’t get pensions (30%), tenants (30%), isolated adolescents up to 17 years old (29%), part time workers (27%) and adults under 65 living alone (24%).” “Over time, the poverty which initially hit elderly people and those on pensions has affected first of all young people and children. And, if the start of the crisis was concentrated above all in rural areas, it has spread into urbanised ones. Finally, the poverty which began spreading amongst less educated sectors of the population, today effects people with higher qualifications”, concluded Nikolaos C. Kanellopoulos. During this time, “the poorest 10% of Greeks have seen their incomes fall by 86% between 2008 and 2012 while the richest families have only lost 17 to 20% of their resources”, points out the IMK study. In the same period the tax burden has climbed by 337% for the poorest families while rising only 9% for those with the highest incomes. Tax fraud, the veritable scourge of Greece, is one of the main reasons for tax inequalities, deplores IMK, in a study published by two University of Athens professors, Tassos Giannitsis and Stavros Zoglafakis, in March 2015 and covering the period 2009 to 2012 (http://www.lesechos.fr/enjeux/business-stories/globalisation/02147594633-grece-inefficiences-corruption-et-clientelisme-aggravent-la-crise-sociale-1120335.php# ). 3. A German institution linked to the DGB, the German trade union confederation. 8. See: http://cib.natixis.com/flushdoc.aspx?id=84801 It’s the same document that is quoted in the rest of this text. 9. The president of the Eurogroup Jeroen Dijsselbloem said that he was not afraid that this election would put the reform process in danger. “A very large majority have supported the package of measures in the Greek Parliament and we await perhaps even stronger support” after the elections. Just before the official announcement, the cabinet spokesperson for the President of the European Commission Jean-Claude Juncker, Martin Selmayr, tweeted: “The coming elections in Greece could be the means to increase support” for the third loan plan. The Commission “respects the decision of Prime Minister Alexis Tsipras to rapidly organise a poll”, said the spokesperson Annika Breidthardt at a press conference. “Many of the opposition parties have voted in favour of the new debt plan”, she recalled, insisting on the fact that “despite the elections, the reforms can be put in place”. “After the decision by the government and the vote in Parliament, there is no need for a new political decision for it to be accomplished”, she concluded. 10. Source: New Statesman, 13 July 2015, interview with Yanis Varoufakis. 11. The SDR is an international reserve asset, created by the IMF in 1969 to supplement its member countries’ official reserves. Its value is based on a basket of four key international currencies, and SDRs can be exchanged for freely usable currencies (source: IMF https://www.imf.org/external/np/exr/facts/sdr.htm ). 12. “Those who hold deposits will lose some purchasing power. Not nominal value, but some purchasing power. But they will gain because the purchasing power of what they owe in debt will also decline. So the majority of people will probably gain from this”... But, in fact, the only ones to “gain” something are those who can borrow money, therefore not the dispossessed. 13. Source: New Statesman, 13 July 2015, interview with Yanis Varoufakis. Costas Lapavitsas is an MP in the Greek Parliament, member of the Left Platform of Syriza, and professor of economics at SOAS (School of Oriental and African Studies) in London. Syriza, Podemos, Left Front… May capital's far left die!